New Split Pivot rear suspension design and refined geometry improves handling, bump absorption, braking, pedaling efficiency and stiffness. 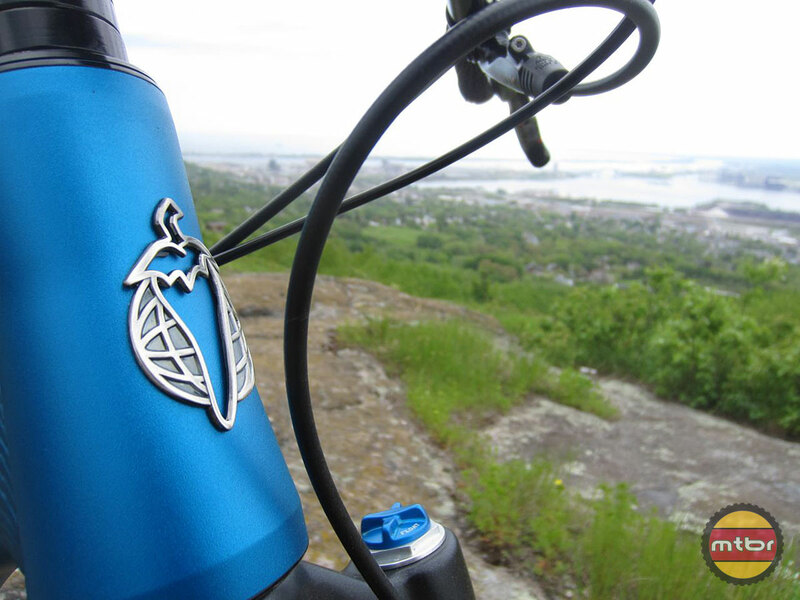 The Spearfish XX1 on Piedmont Trails above Duluth. With the rise in popularity of marathon and 24 hour cross-country racing, Salsa has carved itself a tasty niche in the mountain bike world. Targeted for riders who consider 100 miles per day a leisurely jaunt, the Salsa Spearfish has been an ideal choice with those who love to explore the far reaches of wilderness, featuring 29-inch wheels and lightweight full suspension design that minimizes body fatigue. 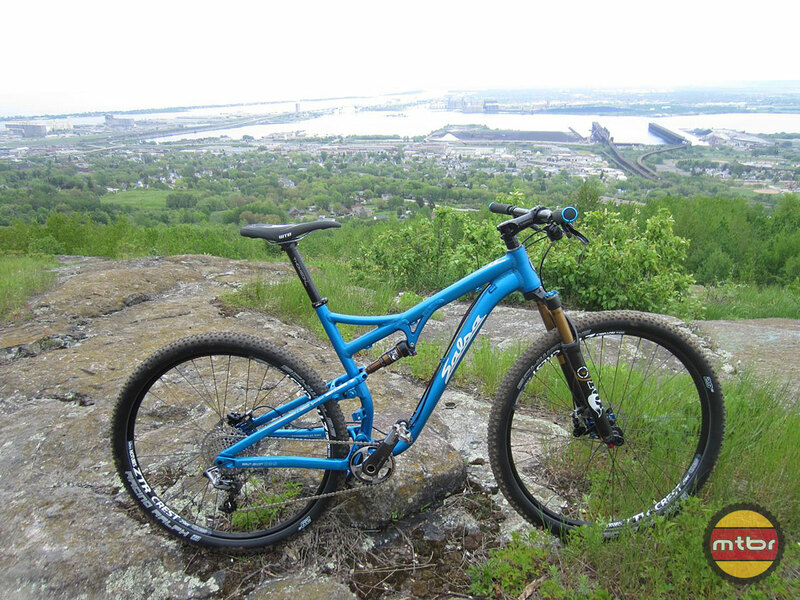 Mtbr was invited by the Salsa crew for a couple days of riding in Duluth, Minnesota on the fully redesigned 2014 Spearfish featuring David Weagle’s revolutionary Split Pivot rear suspension design. The Salsa crew doesn’t just talk the talk, they walk the walk, fully living up to their slogan “Adventure by Bike”. As this is being written, Salsa design engineer Sean Mailen and Ryan Horkey are preparing for a seven-day excursion on the Colorado Trail with their Spearfishes; a 400+ mile adventure with 90,000 feet of climbing between Denver and Durango. Gorgeous anodized teal finish topped off with the chili pepper. To further prove its marathon pedigree, Salsa holds a number of endurance racing records, including the fastest time on the 700+ mile Arizona Trail, ridden by Kurt Refsnider on a Spearfish. As popular as the Spearfish has been, Salsa knew they could make it even better with a revised rear suspension design. Instead of spending years developing their own rear suspension design, Salsa engineers decided to keep matters simple and solicit the help of suspension guru, David Weagle. Known to many as DW, Weagle is most noted for his World Cup Downhill podium-winning DW-Link suspension. But Weagle also holds the patent to Split Pivot, an innovative design that vastly improves braking, traction, stiffness and bump absorption. David Weagle’s Split Pivot is the nucleus of the Spearfish redesign. 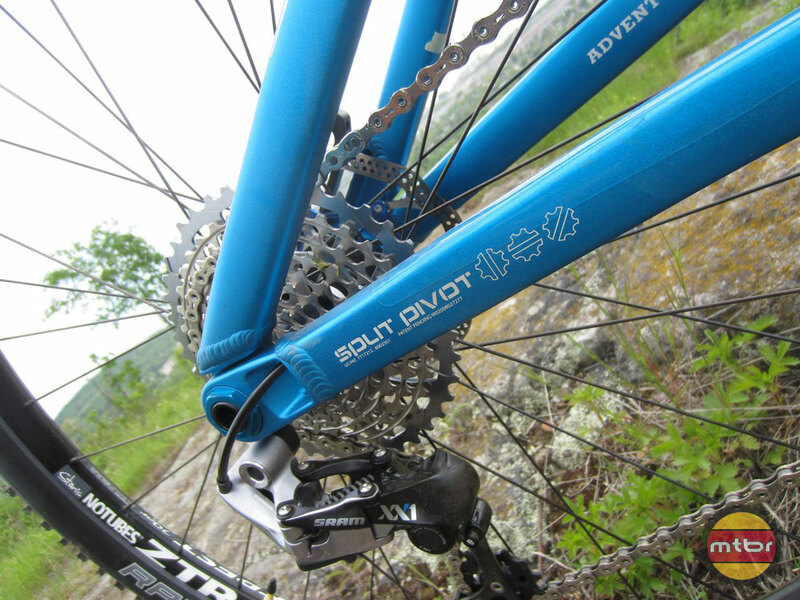 Split Pivot is the heart of what’s new in the 2014 Salsa Spearfish. As a self-admitted rear suspension dimwit who rides a hardtail singlespeed, I really had no idea what the true benefits of Split Pivot were. Thankfully Salsa provided us with three bullet points to easily and clearly sum up why Split Pivot is better. 1) The rear shock is solely tasked with bump absorption, eliminating the need for excess low-speed compression damping found with other designs. 2) Pedaling performance is independent of bump absorption, which means that whether you’re coasting over rocky, rooty sections of trail or pedaling through it, the rear shock performs exactly the same. 3) Braking performance is also independent of bump absorption, eliminating annoying brake chatter and vastly improving traction under braking. It should be noted that one of the big priorities of Weagle in redesigning the Spearfish was making sure the bike used off-the-shelf, factory-tuned shock setups. No special tuning setups were needed to make the Spearfish work, making matters easier for both mechanics and riders. By adding in a 12x142mm Maxle rear through axle and FEA-optimized AL-6066 tubing, the redesigned Spearfish rear end is also vastly stiffer than its predecessor, improving lateral stiffness by a whopping 21 percent. In addition to stiffening the rear end, Salsa engineers wanted to improve agility and handling by shorting the chainstays to only 437mm, among the shortest chainstays of any full-suspension 29er. Seatstays are isolated from pedaling forces so braking and suspension can work together. Despite these significant changes in the rear suspension, Salsa engineers wanted to maintain the essence of what has made the Spearfish so successful. Therefore, the 80mm of rear suspension travel remains unchanged and the front triangle is very similar to the original. Frame layout and geometry also carry over with slight enhancements including the ability to run as wide as 2.35” tires. In order to deliver relaxed, stable and confident handling, Salsa engineers slackened up the head tube angle to 69.3 degrees across all frame sizes (XS, S, M, L, XL) while pairing it with a 100mm travel by 51mm offset Fox fork. Salsa firmly believes that 51mm offset is the standard for 29” wheels. Fit and finish of the Spearfish is also improved, with blinging anodized finish options in teal, green and orange that get the press-fit BB92 bottom bracket shells and tapered head tubes faced and reamed after paint and anodizing is complete; an extra step most other manufacturers neglect. 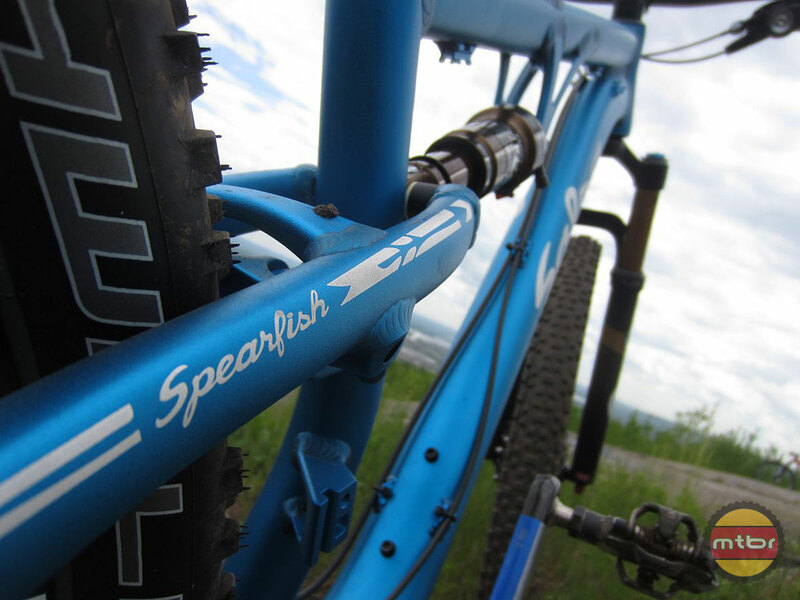 Continue reading for Spearfish riding impressions, more information and full photo gallery. 24 hour races are shutting down left and right. Enduro is the new 24. They are? Last I saw 24 Hours in the Old Pueblo sold out within a few weeks of registration opening. More than 2,000 participants. Enduro is new and might be very popular, but it remains to be seen if it has longevity. I hope it does, as it’s a great format, but time will tell. Lethargic acceleration of a 29 wheel isn’t overcome by linkage tuning or CS shortening. It’s all to do with wheel (incl tire) weight. So I’m not sure I understand how you can say this 29 FS bike has fixed the acceleration problem, unless it had markedly lighter wheels/tires compared to every other 29 bike you’ve ridden. Look the frameset has become even more swoopy. With those curves it does look like a lot of other high end bikes. While I find the numbers and configuration suit me – I hate all these curves that seem to be “styling cues”. Bring back the diamond esque styling! That being said a new Spearfish is high on my list to replace my old Giant NRS and bring me into the modern MTB world. You’re right. It’s still slower than a 26″ out of the saddle. It just the perceived acceleration is faster than what I’ve experienced with other 29ers, especially full suspension 29ers. I went from riding the Horsethief to the much lighter and faster Spearfish, so that might have had something to do with my perceived acceleration observations. Because as soon as I got home and got back on my 26″ hardtail, I realized the Spearfish wasn’t nearly as quick off the line. As you eluded, its a law of physics. Regardless, the Spearfish is still very quick off the line. I just don’t like press fit BB, but everything else looks good. If it’s not broken, don’t fix it. Too bad Salsa ignored the old adage. The absence of a pivot on the rear triangle is what makes the original spearfish the best riding full suspension mountain bike in the world (and I’ve ridden me all). The seat says gave resilience and a unique stiff yet plush ride with superb handling. I haven’t ridden the new spearfish yet but I suppose it will bog down just like all the other d’s bikes with this same design . What a shame. Salsa, you really blew it! The new spearfish looks like crap. I prefer my original spearfish one in black/white/red.